We at Dharti Industries, Rajkot has serving Agriculture and Food processing sector since last so many years . We are still improving our self to provide better quality agriculture equipments to serve farmers . We are manfuacturer many kinds of Hand Sickle , Garden Grass cutting Sickle , Plastic Hand Sickle . SITCO make available the customers with premium agricultural tools. 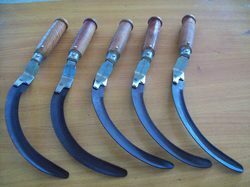 Sickle is a very useful agricultural tool having a variously arched blade. This hand-held tool is used for cutting luscious forage to feed livestock and also for the harvesting of grain crops. We are offering Agricultural Sickle to our clients. Agricultural Sickle that is available in various lengths and thicknesses at most competitive prices. All our products are widely acclaimed by the customers for their longer service life, abrasion resistance and high elasticity. We are the one one the leading manufacturer for hand operated grass sickle with unbreakable plastic handle and self sharpening teeth. We are whoeseller as well as retailer for all kind of garden hand sickles.